Hello. 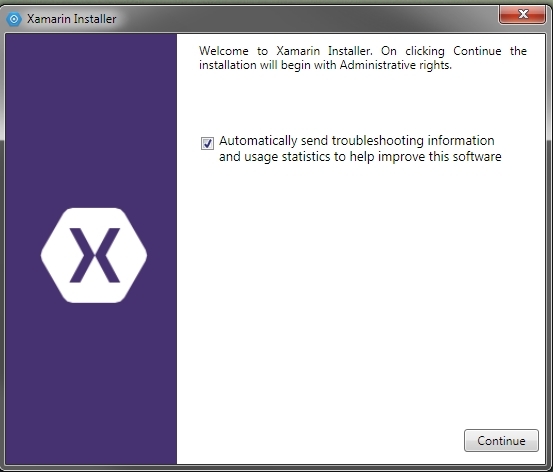 I'm trying to install Xamarin for Windows, but I'm having trouble. It seems the installer doesn't start. When I fire the XamarinInstaller.exe file that I'm downloading from https://xamarin.com/download, all I get is the initial install screen. Then I click Continue and the screen goes away and then nothing! Attached is the screen I see and my system information. Any help would be great. Thanks. Thanks for the reports! There was a mistake where the latest installers were signed with certificates that have just expired today (November 21). I'll close this thread as a duplicate of the new thread to help consolidate any further discussion.